History: (What If? 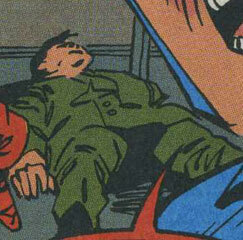 II#51 (fb)) - During a battle with the Red Skull, Captain America was caught in a bomb-blast, losing most of his body. Meanwhile, Frank Castle served a stint in Vietnam. As Steve Rogers was being kept alive in a military hospital beneath the Pentagon, he asked Nick Fury to find a replacement Captain America. With Rogers' request, the National Security Council asked Henry Peter Gyrich to find a replacement for the symbol that was Captain America. At the NSC's meeting, Fury asked if Gyrich had found anyone to fill Cap's shoes and one of the officials suggested Frank Castle, using Castle's military record to prove his worth. Shortly after, Castle was visited by a messenger of the NSC and asked to become Captain America which he declined, claiming that he had served his country well and his time was over. With Castle's refusal, the NSC tried several different Captain Americas, all of which failed in one way or another. 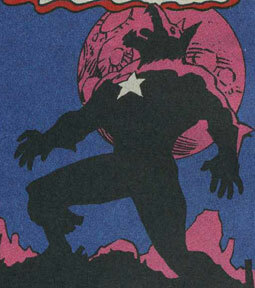 John Jameson was the first but he came under the spell of a strange gemstone and was transformed into the Man-Wolf. The next candidate was Robert Diamond, who died battling Count Nefaria. Following Diamond was Doctor Leonard Samson who lost control mid-battle causing several civilian casualties. The final candidate was Kyle Richmond who became a pawn of Baron Blood after Blood bit him during a battle between the two. Frank Castle finally signed on to become the new Captain America when his family was murdered in a gangland execution. (What If? II#51) - Taking Steve Rogers' place on the Avengers, Frank Castle became the new Captain America and quickly led the Avengers against a gang war where he brutally beat Hammerhead within an inch of his life. Following the mission, the Avengers spoke with Nick Fury concerning Castle's brutality but Fury explained that while he agreed something had to be done, the NSC disagreed due to Castle's results on crime. As night set, Castle donned a skull-themed outfit and took the streets as the Punisher, killing members of the Bruno Costa mob to avenge his family's death. After many nights of such killing, Gyrich spoke with the NSC concerning his violent tactics, agreeing that they would have to stop him the hard way. The following night, after the Falcon attempted to speak with Castle about living up to Rogers' name, Castle once again attacked the mob as the Punisher. His battle with the mob was interrupted by the arrival of Steve Rogers in the Captain America outfit. 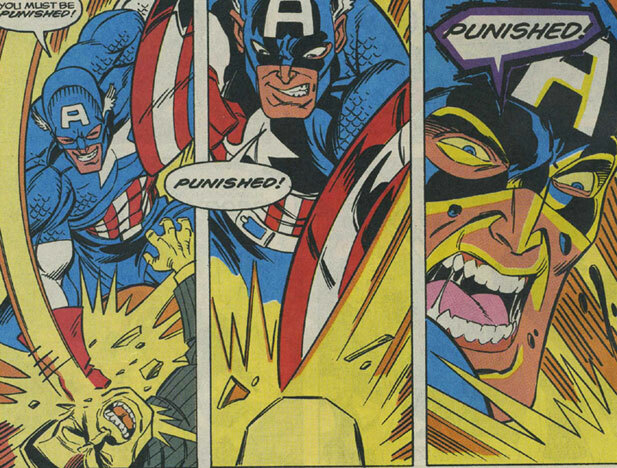 Following a brief battle between the two, Rogers easily forced the Punisher to the floor, demanding that Castle continuing being Captain America. Castle asked why Rogers himself didn't return to being Captain America. Rogers explained that Captain America needed to be a flesh and blood, mortal man. He then pulled up his sleeve to reveal a cybernetic arm and announced that he was neither. Before Rogers could continue, Kolsky of the Costa mob fired at the duo and during the commotion, Castle made his escape. Cornering Bruno Costa himself, the Punisher considered killing him but, inspired by Rogers' speech, decided against it. He then brought Costa to justice and Rogers revealed that he had seen the entire thing. Feeling that Castle had finally learned what it meant to be Captain America, Rogers gave his shield to Castle. Castle returned to being Captain America, while the newly cybernetic Steve Rogers continued crime-fighting as the Captain. Comments: Created by Simon Furman, Paris Cullins, F. Turner, & D. Cooper. The divergent point for this reality occurred during the events seen in Captain America I#212 (August, 1977), though on Earth-616, Frank Castle had already become the Punisher by the time that Captain America battled the Red Skull in Cap#212. In this reality, Frank Castle was serving a tour of duty in Vietnam when Cap battled the Red Skull, so it could be argued that this reality diverged during one of Castle's stints in Vietnam. 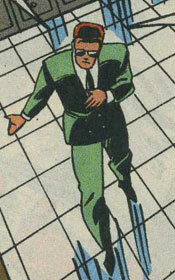 Luis Allegre was a member of the Bruno Costa mob family (like his Earth-616 counterpart) and was present when Skinner met with Hannigan and a group of other Costa mob members. When Frank Castle first donned the Punisher costume, he attacked them at the meeting and shot Allegre dead. The Avengers were basically the same as their Earth-616 counterparts up until Steve Rogers was injured fighting the Red Skull. When Frank Castle became the new Captain America, he led them against a gang war where he brutally beat Hammerhead. 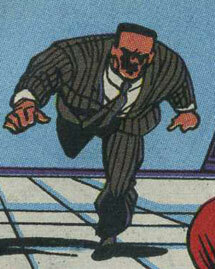 Following that mission, the team met with Nick Fury to discuss Castle's behavior. They all agreed that something had to be done. They were (from left to right): Scarlet Witch, Wasp, Falcon, Captain America (Frank Castle), Iron Man, Vision, and the Beast. Baron Blood was the same as his Earth-616 counterpart, the only exception being that the Captain America that went up against in the modern era was Kyle Richmond, who easily fell before Blood and was bitten by him. Richmond then became a thrall of the Baron. 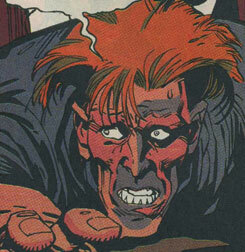 Like his 616 counterpart, Baron Blood had the conventional powers of a vampire, including the ability to transform others into his vampiric thralls with a bite. Once Captain America, Steve Rogers was gravely injured by a bomb-blast while battling the Red Skull. Surviving only via life support, Rogers requested that another man of flesh and blood become Captain America to continue his legacy. When Frank Castle was chosen and began killing criminals in the guise of the Punisher, Rogers was given cybernetic parts to replace his broken body and confronted Castle. Explaining to Castle how important the symbol of Captain America was, Rogers inspired Castle to continue the Captain America legacy and bring Bruno Costa to justice rather than kill him. With Castle as Captain America, Steve Rogers took to using the codename of the Captain and continued fighting crime. With his cybernetic parts, Steve Rogers had superhuman strength, durability, and resistance. He also made a reference to no longer being mortal, so it was possible that the due to the cybernetics, he had superhuman longevity or even immortality as long as his parts could be repaired. Frank Castle was a Vietnam veteran who was twice decorated with both the bronze and silver stars, as well as four times with the purple heart. Following his tours of duty in Vietnam, Castle returned home to train marines in New York. When Steve Rogers was injured, Castle was asked to become the new Captain America, an offer he declined. Upon the deaths of the his family at the hands of the Bruno Costa mob, Castle agreed to ingest the Super-Soldier Serum and become the new Captain America. He immediately made a name for himself with his brutal tactics and even donned the costumed identity of the Punisher at night to take a lethal stand against the Costa mob. 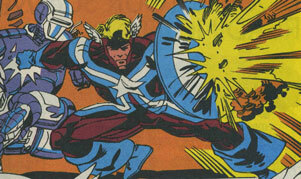 When his one-man fight against the Costas caught the attention of the National Security Council, Steve Rogers was sent in to halt Castle's rampage. Inspired by Rogers to continue on, Castle brought Bruno Costa to justice rather than kill him and continued as Captain America after the battle. Due to the Super-Soldier Serum coursing through his veins, Frank Castle had peak human physical abilities and longevity. Bruno Costa was head of the Costa mob family and was very similar to his Earth-616 counterpart up until Frank Castle (as the Punisher) spared his life rather than kill him. Count Nefaria was essentially the same as his Earth-616 counterpart, excepting his murder of Robert Diamond when Diamond battled Nefaria in his guise of Captain America. Like his Earth-616 counterpart, Count Nefaria could project ionic energy and presumably had superhuman strength, flight, and other abilities associated with ionic energy beings. Robert Diamond was an actor/martial artist member of the Sons of the Tiger, just like his Earth-616 counterpart. When Steve Rogers was injured in a battle against the Red Skull, Diamond was one of the replacements who was given the Super-Soldier Serum. During his tenure as Captain America, Diamond was killed in battle against Count Nefaria. Due to the Super-Soldier Serum, Robert Diamond had peak human physical attributes and longevity. Doctor Leonard Samson was just like his 616 counterpart up until he was chosen as a replacement Captain America. Unfortunately, the Super-Soldier Serum combined with the gamma radiation in his bloodstream caused Doc Samson to lose control in battle, an act that ran high in civilian casualties. Following that disgrace, Samson retired as Captain America. Doc Samson had superhuman strength and durability like his Earth-616 counterpart. Nick Fury, like his Earth-616 counterpart, was the head of S.H.I.E.L.D. When Steve Rogers was injured as Captain America, Fury stood by his side and tried to talk the NSC out of using Frank Castle as a recipient of the Super-Soldier Serum. The NSC went ahead as planned and when Castle began showing brutal methods of dealing with crime, Fury met with the Avengers to discuss what to do about him. Nick Fury presumably remained vital due to the ingestion of the Infinity Formula. 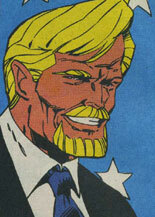 Henry Peter Gyrich worked for the National Security Council, just like his Earth-616 counterpart. When Steve Rogers was injured, Gyrich helped the NSC think of Frank Castle as a replacement. Unfortunately, Castle's one-man war on crime drew the attention of Gyrich, who immediately began thinking of ways to halt the Punisher's rampage, eventually deciding to cybernetically repair Steve Rogers' broken body and send him to deal with Castle. Hammerhead was very similar to his Earth-616 counterpart. He participated in a gang war that drew the attention of Frank Castle, who led the Avengers against the mobsters as Captain America. During one such battle against the Avengers, Hammerhead tried to fight Castle, who beat Hammerhead within an inch of his life. Like his Earth-616 counterpart, Hammerhead had a steel plate covering his skull that gave his head enhanced durability and hardness. 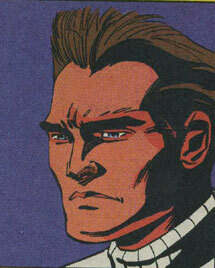 Byron Hannigan was a member of the Bruno Costa mob (like his Earth-616 counterpart) and was present when Frank Castle first made his appearance as the Punisher. During the mob's battle with the Punisher, Hannigan was shot dead. Kolsky was a member of the Bruno Costa mob family who shot as the Punisher and Steve Rogers during Castle's failed attempt at killing both him and Bruno Costa. After he fired on the two, Steve Rogers knocked Kolsky out with a kick to the face. John Jameson was very similar to his Earth-616 counterpart up until he was chosen as a recipient of the Super-Soldier Serum. His tenure as Captain America did not last long however, as soon after becoming Captain America, Jameson fell under the sway of the moongem and was transformed into the Man-Wolf. After his transformation, the National Security Council left him alone and searched out a new Captain America. As the Man-Wolf, John Jameson had enhanced strength and senses. He also had razor-sharp claws and teeth. 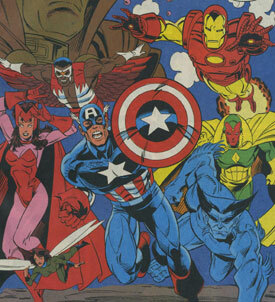 The National Security Council (NSC) was the same as their Earth-616 counterparts. When Steve Rogers was injured, the NSC chose Frank Castle as a replacement despite Nick Fury's reservations. When Castle became more and more unhinged, the NSC had Steve Rogers cybernetically rebuilt in order to halt Castle's rampages as the Punisher. 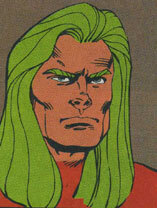 Kyle Richmond was similar to his Earth-616 counterpart up until he was chosen to become Captain America following Doc Samson's loss of control. He was given the Super-Soldier Serum but failed as the new Captain America when he became a vampiric thrall of Baron Blood during a battle with the vampire. Kyle Richmond had peak human physical abilities and longevity due to the Super-Soldier Serum. After becoming a thrall of Baron Blood, he presumably had the conventional abilities of a vampire. 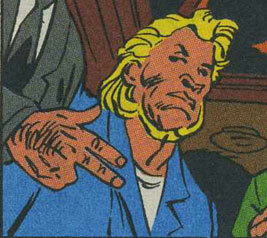 Skinner (like his Earth-616 counterpart) was a member of the Bruno Costa mob family. He was present at the Costa meeting when Frank Castle first donned the Punisher costume and murdered most of them. Skinner was knifed in the back by the Punisher but his life was spared so that he could spread the word that the Punisher was coming for the mob.